Bedrooms are sanctuaries for rest and recuperation, so it’s important that the décor we choose for them helps promote a relaxed environment. Shutters have that timeless appeal for subtly stylish look, so make a great choice for bedrooms. 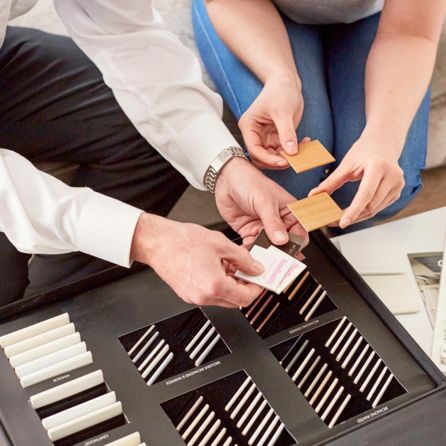 We offer a range of colours and finishes for our shutters, but whites, creams and greys are best for creating a calming atmosphere. Getting a good night’s sleep is a priority for many, but unwanted noise drifting in from the outside world can keep us awake at night. 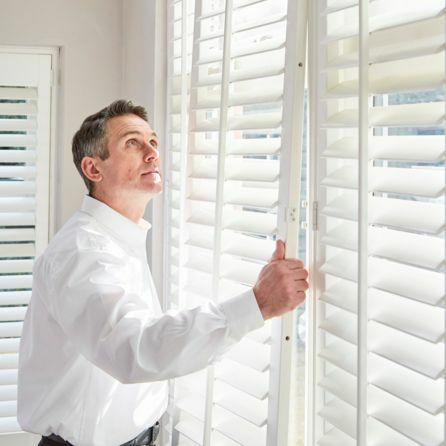 Shutters help minimise the amount of noise coming through your windows, so you’ll have a better chance of a restful night. As well as looking simply stunning, our shutters are also incredibly energy efficient. They protect your bedroom from unwanted draughts and chills and, during the cooler months, help keep the warmth in the room with you too. This is especially important if your bed is positioned close to your windows like in this pretty pastel bedroom. French doors are a beautiful addition to any room, but when they’re in the bedroom they really give your home that wow factor. Our shutters can be made to fit French doors too, so if you’ve got shutters throughout the rest of your home, you’ll be able to match them for co-ordinated look. Your advisor will show you all the options available during your home appointment.